Do you think you can change the world through Design? 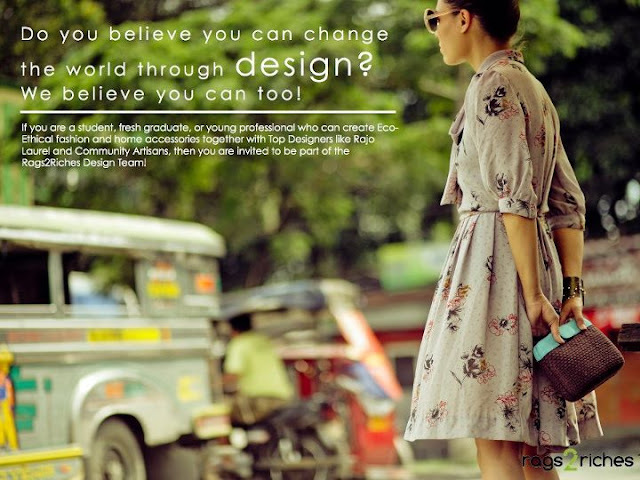 If you are a student, fresh graduate, or young professional who can create Eco-Ethical fashion and home accessories together with Top Designers like Rajo Laurel and Community Artisans, then you are invited to be part of the Rags2Riches Design Team! Strong background in pattern making (for home and fashion accessories), sewing, and even crafts (macrame, crochet, basket weave)! How many Design Interns will be accepted? There are only 3 slots for this position for this year. Is this a good career path for me? We believe so! And because we believe in sustainability, we will provide an allowance and a ton of rich experience for successful applicants! What is the duration of the internship? The contract is for 3 months but can extend indefinitely if we are a match made in heaven! How can I apply? Send us your resume, some copies/samples of your work, and a short and sweet letter of why you should be Rags2Riches' Design Intern and Ambassador. You can send via email to reese.fernandez@rags2riches.ph and kim.panuncialman@rags2riches.ph!